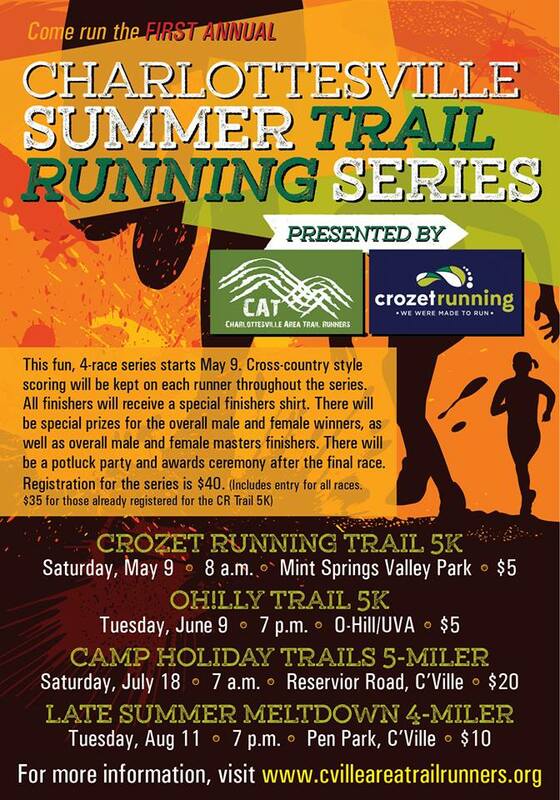 The CATs and Crozet Running are putting together the inaugural Charlottesville Summer Trail Running Series for 2015 consisting of four races on trails in and around Charlottesville and Crozet, VA. The distances for the races vary from 5K to 5 miles and are open to all ages, skill levels, and speeds ( are welcome too). Runners can register for the Series at the Crozet Running 5K or online here on May 9th. Cook-out to follow race with series awards and fun! Race entry for the full series is $40. Racers can also pay slightly more for each individual race. Sign-up will be available at the Crozet Running 5K and on-line after May 9th. Come join us for this summer series! We welcome all runners, trail lovers, and individuals looking to get out and have fun!